Screenmailer is a new screencasting/screen recording tool for Mavericks on the Mac. It is easy to use, quick to render, and can be used as an on-the-spot solution for teacher or student screencasts! As with any screencast, you should first plan your recording, get things set-up on your desktop, practice your script, and then start the recording. Screenmailer runs on your Mac, and, once installed, allows you to log-in with Google credentials or create a Screenmailer account. You will need to be connected to the Web in order to use Screenmailer. 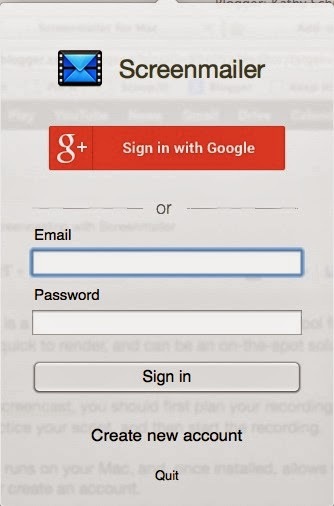 Once you log-in, as you seen above, you can see your previously-recorded videos, play them, delete them, email the link to someone, or copy the link. 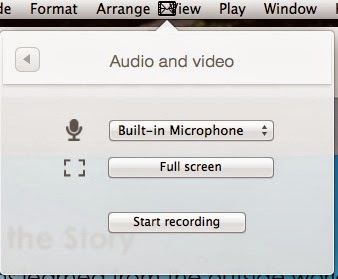 And, of course, you can begin a new recording by picking the record button. You then get a choice of the audio input source and whether to record the full screen or to outline an area of the screen to record. The developer of Screenmailer recommends outlining an area rather than using the full screen option, especially if you have a hi-res screen. You can record a video for up to 30 minutes and easily pause the recording to collect your thoughts or change what is on your computer screen. This comes in handy when showcasing different content during the screen recording. Also, you can see you can easily record yourself (or any other video) at the same time you are showcasing content. One option that should be coming soon to Screenmailer is the ability to download the video either in the app or on the video play page. Until that happens, you can use the Firefox extension Video DownloadHelper to download the video to your computer for use in a presentation, putting into a content management system, or uploading to your YouTube or Vimeo channels. (Thanks to Tom Gavin for the find!) It has worked for me on my desktop with no special set-up. I suggest you pick .MP4 as the download format so it is compatible with many sites and programs. If you have any ideas or thoughts for the developer of Screenmailer, his contact information is on the Screenmailer home page. He is very receptive to ideas for future features. And follow @screenmailer on Twitter to find out about any new features! 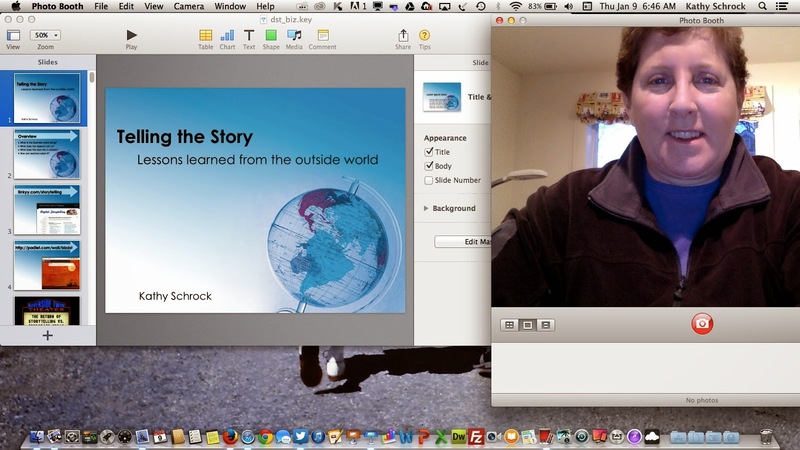 If you are going to be creating screencasts for students or having students create their own, I have a blog post dedicated to the idea, Screencasting for Educators, and a Web page, Screencasting in the Classroom, with links to successful practices, resources, and much more. 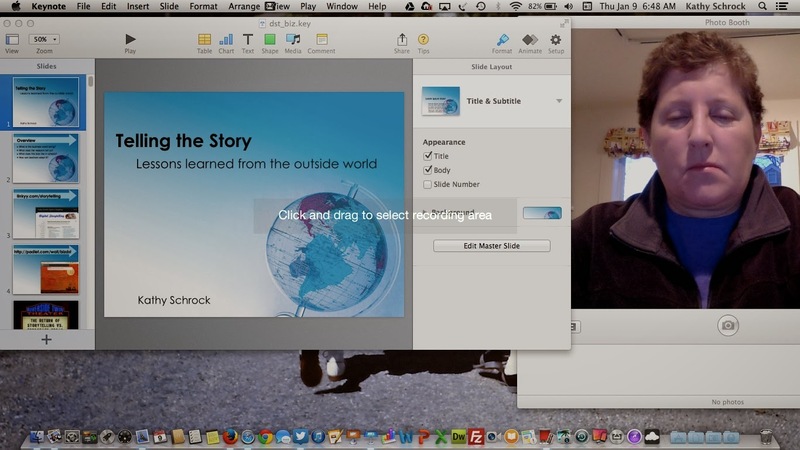 If you create any screencasts for the classroom with Screenmailer, share the URL with me via email. We can all learn new techniques for creating engaging screencasts from each other! First published in the AWSA Update Bulletin, October 16, 2013. Some information has been updated below. Infographics are everywhere! We see them on the Web and in our professional journals. Students see them on Facebook and on advertiser’s pages. How can the use of infographics be used to address the Common Core State Standards? An infographic is a visual representation of information. It differs from a poster in that it usually includes graphs and charts of information. Not all infographics include data, though. There are quite a few types of infographics, as listed below. There are two basic ways infographics can be used to support teaching and learning. The first is showcasing already-created infographics to support a specific content area. For example, a health class might use an infographic entitled “A Tale of Two Meals” or an English class might use one called “A Literary Map of Manhattan” which includes clickable links to the places in Manhattan where famous literary characters resided. The second way infographics can be incorporated into teaching and learning is by having students create an infographic as a formative or summative assessment. By creating an infographic, students are conducting research and gathering assets to use for their infographics (information literacy) working with color, fonts, and layout to impact their audience (visual literacy), presenting their infographic to persuade, convince, or inform (media literacy), and using technology tools and data visualizations to create the infographic (digital literacy). In addition, of course, they are demonstrating mastery of content knowledge with the content-specific information they include in the infographic. The rubric below can be used for both of these purposes. When analyzing infographics, students should pay attention to the topic of the image, the type of infographic and whether it is appropriate to the information display, whether the pictorial elements of the infographic and the data visualizations are understandable, if the color, font, and layout add to the presentation of the infographic, and that bibliographic citations are included to allow access to the original source of the information. When creating their own infographic, students need to consider all of these same items while, at the same time, considering the purpose and audience for their infographic. The Common Core State Standards do not specifically mention “infographics”, but there are many standards, both content-based and literacy-based, that can be addressed with both the analysis or creation of infographics by students. Here are a few from both the CCSS ELA Standards and the Standards for Mathematical Practice. In addition, presentation programs such as Microsoft's PowerPoint, Apple’s Keynote program, and Google Slides allow layers of images and text on a slide, so these tools can also be used for student creation of an infographic. There is also an iPad and Android tablet app that helps students create infographics on their mobile devices called iVisual Info Touch Light (iOS) and iVisual Touch Free (Android). 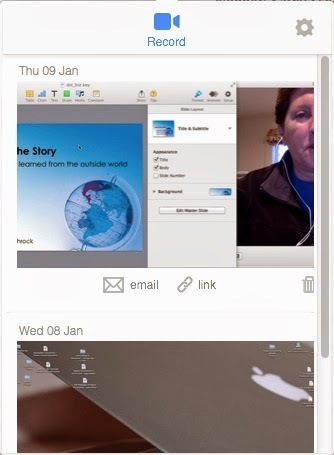 The full-version of the app allows students to bring in their own images and other features. (Added 1/27/15: And there is a great iOS app that includes many publishing formats, and includes infographic creation, called Canva. When introducing infographics to students, teachers should first showcase what data visualizations look like. A great site for students to become familiar with the different types of data visualizations is the Periodic Table of Data Visualizations (http://www.visual-literacy.org/periodic_table/periodic_table.html). When students have collected their data, they can then use Chart Chooser (http://labs.juiceanalytics.com/chartchooser/index.html) to determine how best to present their data. Students should study the infographic rubric and then, in small groups, evaluate infographics on the Web or in print. By looking at infographics with a critical eye, they will gain some insights on to how best to create their own infographic.